Indeed, a lax attitude about preparedness and thorough training lies at the root of most present-day seaborne tragedies. "The reason why very few yachts ever stick their nose out of ports," he explained, "is first they dont know how, and second, when they do theyre insufficiently snap and pop to handle the situation and so get very frightened and never do it again. And so they lie there comfortably being yachtsmen on the nice harbor. "Now this ship had some serious faults, but only for these waters  these waters are particularly vicious. She would just do dandy in Long Island Sound. She would just do fine, except for draft, in the estuaries of Holland. Shell do great in Puget Sound. But she happens to be in the middle of some islands in the great broad Atlantic and youve got the Atlantic greybacks and youve got the Gulf Stream  rough, rough  and these are bad, wicked seas around here and this baby had to be doctored up to take care of it. Well, weve got her doctored up so that she will. But the only other thing she needs is good crew organization, good fast compliance, knowing the nomenclature of what you are expected to handle, and in view of the fact that youre probably not expected to learn more than about twenty words, you should be able to do it very quickly." 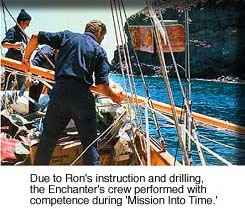 Through rigorous drilling and immediate assignment of on-board responsibilities, Ron instilled in Enchanters first crew the same respect for the sea he had learned years earlier. "When you realize that the old-timers did their great voyages of discovery in ships very little bigger than Enchanter," he pointed out, "you will see that they had their nerve with them." Indeed, even the modest seas that go unnoticed by passengers walking the promenade deck of a cruise ship will toss around smaller vessels, requiring their sailors to hold onto lifelines and handrails just to move around the deck. "It didnt matter what ship you were on," one crew member explained years later. "You were always doing those drills because Old Man Sea doesnt eat you up if youre prepared. Its when youre not prepared that things start going wrong." 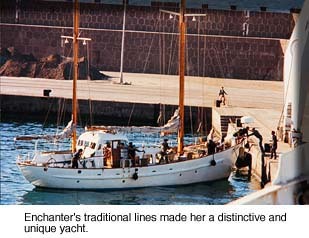 Ron wrote a complete set of instructions on the sailing and care of yachts during his time aboard the Enchanter. His work is a legacy of seamanship, and the techniques he developed for training sailors have been applied again and again to apprentice mariners. "He had this capability of being able to see an enormous amount of detail," said one of Rons trainees who went on to captain the Enchanter, "and his background was so big  it wasnt just on yachting. You could see he was quite capable of handling one of those great big enormous four-masted ships."